The Kibale Chimpanzee Project rarely intervenes directly in the lives of the Kanyawara chimpanzees. However, when humans are directly responsible for life-threatening injuries, such as those from snares, medical care is sometimes offered. 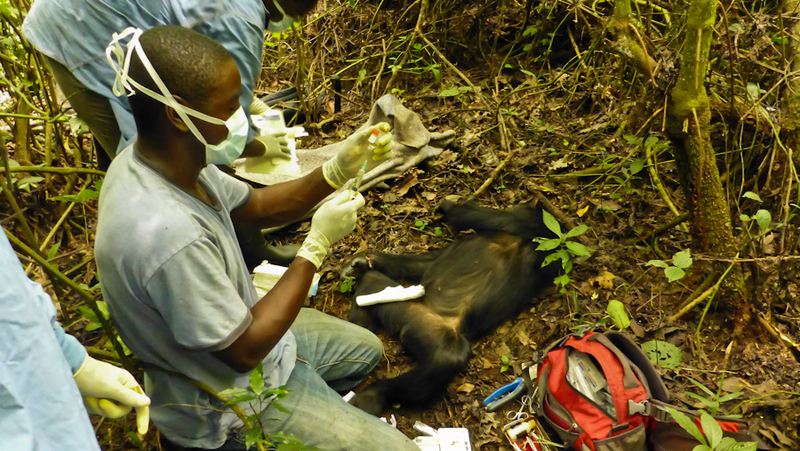 In emergency situations, Kibale Chimpanzee Project staff, in collaboration with UWA, enlist the expert help of veterinarians from the Jane Goodall Institute-Uganda. Chimpanzees who are snared typically cannot remove the wire on their own, and without intervention would suffer maiming, and over time possible amputation, infection, and even death. When conditions allow, we work with veterinary staff to dart the injured chimpanzee so that the snare can be removed and the wound cleaned. 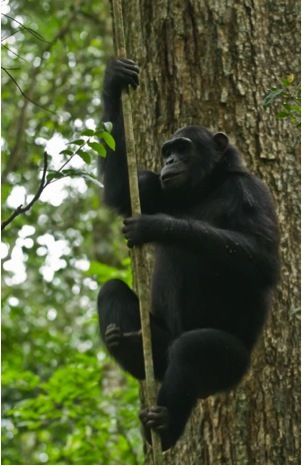 While darting wild chimpanzees is risky and unpredictable, most interventions have resulted in successful snare removal without digit/limb amputation. 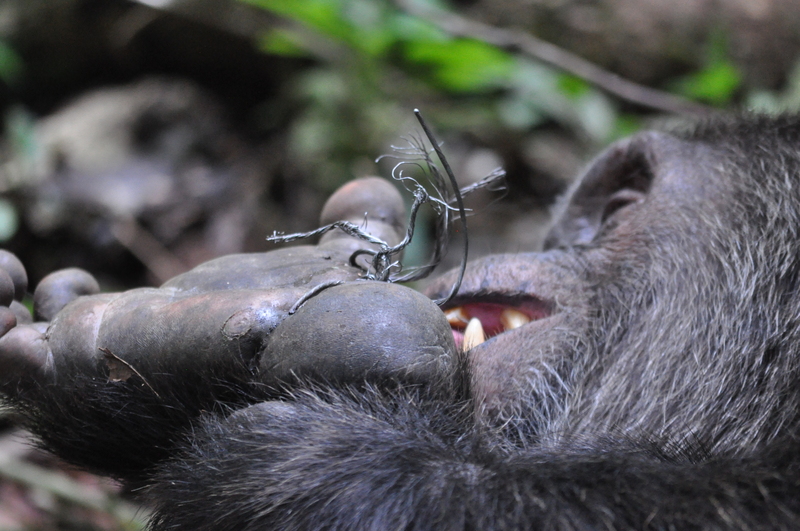 If the injury is detected within a few days of snaring, this greatly increases the chimpanzee’s chance of full recovery without permanent impairments. The chimpanzee in the video above is a young female called Special, snared in July 2012. 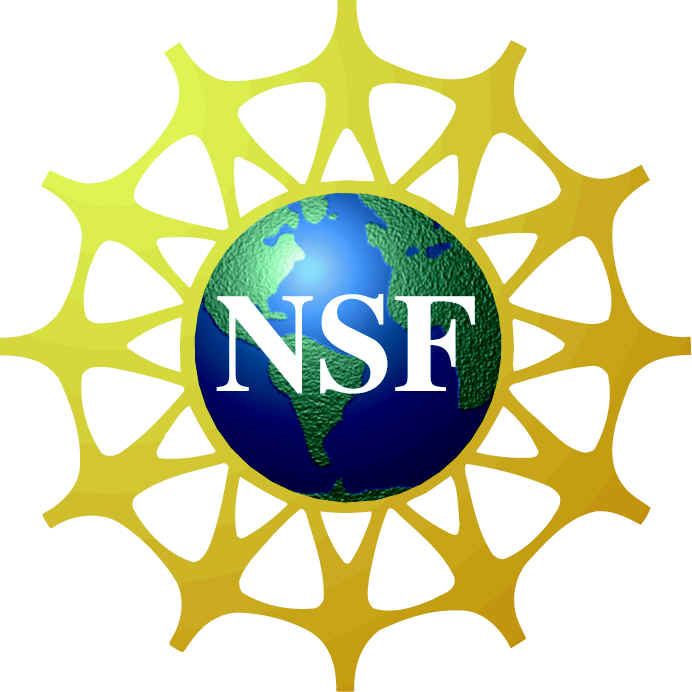 Special was followed closely after KCP researchers noticed the snare, and David Hyeroba, a veterinarian working with the Jane Goodall Institute-Uganda (JGI-U) was called to attempt to remove the wire. Special’s injured wrist was obviously a severe physical and social impediment. She could not use her right hand to walk, climb, or support any weight, and although she was travelling with a large group of chimpanzees, she was often secluded, grooming herself and gnawing at the wire on her wrist. Her behavior was notably lethargic, likely due to the pain and decreased feeding. 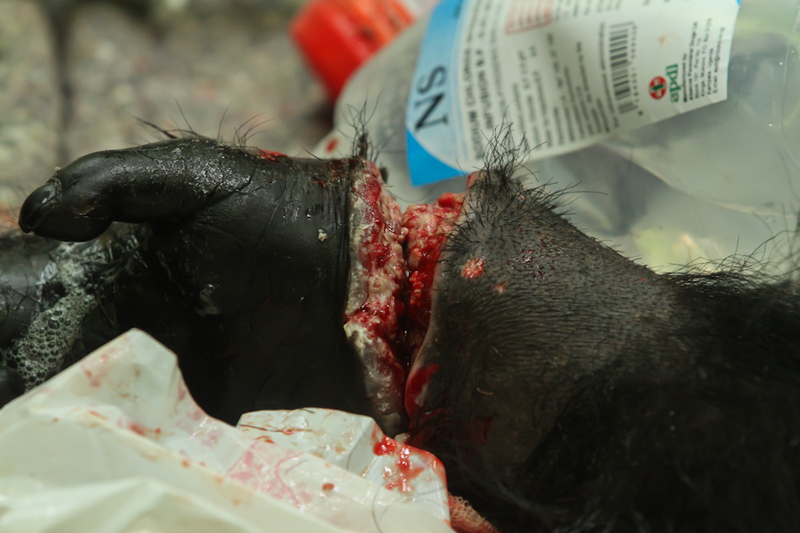 Dr. Hyeroba darted Special successfully, and discovered that the snare wound was very deep, with the wire cutting to the bone almost around her entire wrist. Special was under anesthesia for about two hours as her wound was thoroughly cleaned and stitched. After an hour and a half of recovery, she began walking at a seemingly normal pace. She travelled a bit and rested for an hour before climbing into an old low-lying nest in the early evening. Despite the severity of the wound, Special made a full recovery, and was able to use her hand normally after a few months. In August 2013, Lanjo (an adult male) was injured by a wire foot snare during a consortship with an estrous female along the southern edge of the Kanyawara home range. Luckily, Lanjo rejoined the community shortly after being snared, and KCP field assistants noticed his injury. Emergency assistance was requested, and JGI notified the veterinarian. The next day the veterinarian sedated Lanjo and removed the wire snare from his foot. Due to quick action, in less than one month Lanjo’s foot had fully healed , and he is now one of the highest ranking males in the community. Without this intervention Lanjo might have suffered the same physical and social fates as Max.